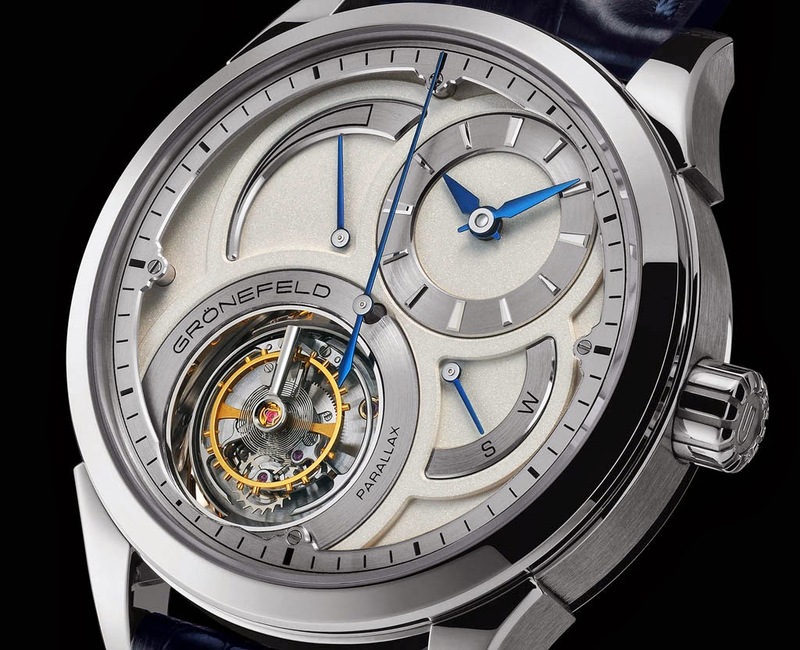 The new beauty of the Dutch Grönefeld brothers is the Parallax Tourbillon featuring a "flying" tourbillon with a large central seconds hand, stop seconds, as well as power reserve and winding/setting mechanism indications. 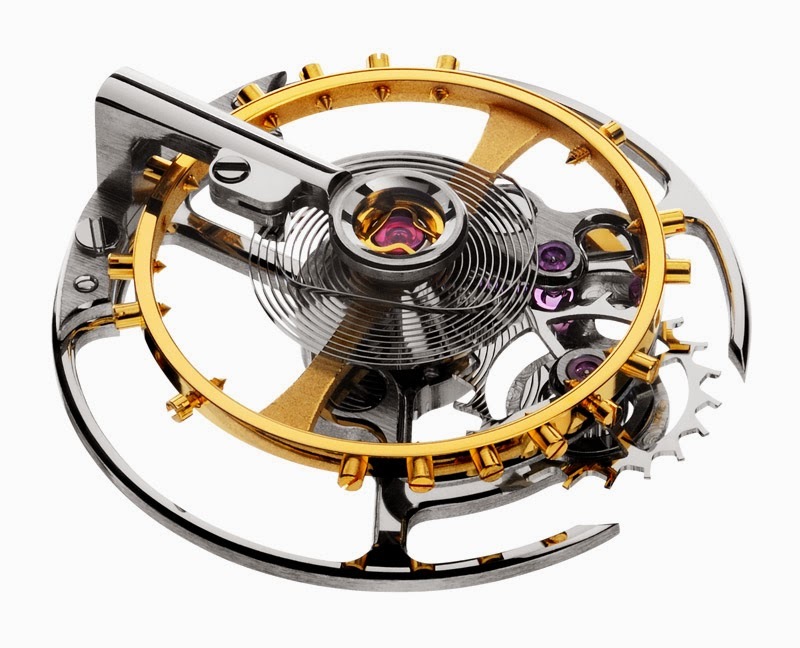 The tourbillon cage encompassing the oscillating balance wheel is crafted in stainless steel and rotates once a minute around its axis, minimising the negative influence of gravity, and consequently improving the timekeeping of the watch. 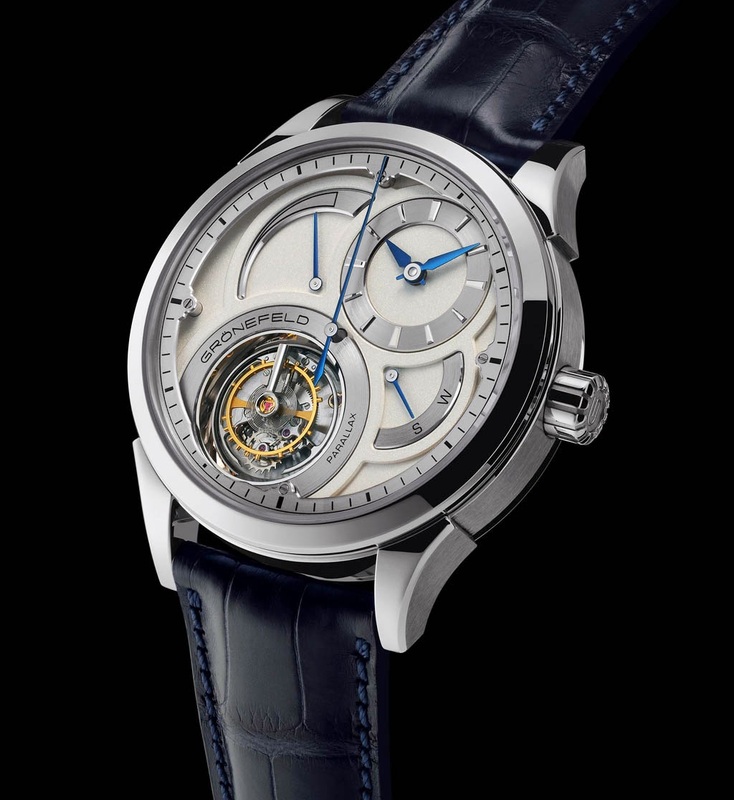 Invented in 1795 by Abraham Louis Breguet to compensate the effects of gravity on the balance, the mechanism was further enhanced in 1920 by Alfred Helwig which was able to remove the upper support bridge so creating a "flying" tourbillon. The name "Parallax" is derived from the precision of the readability of the central seconds hand. Parallax is defined as the apparent change in position of an object when the observer changes his own position. To minimise the possibility of error due to parallax when viewing the seconds hand from an angle, the hand is exceptionally close to the outer chapter ring with the seconds indexes. Normally a central seconds hand requires a friction spring to prevent small fluttering caused by play in the gear train. 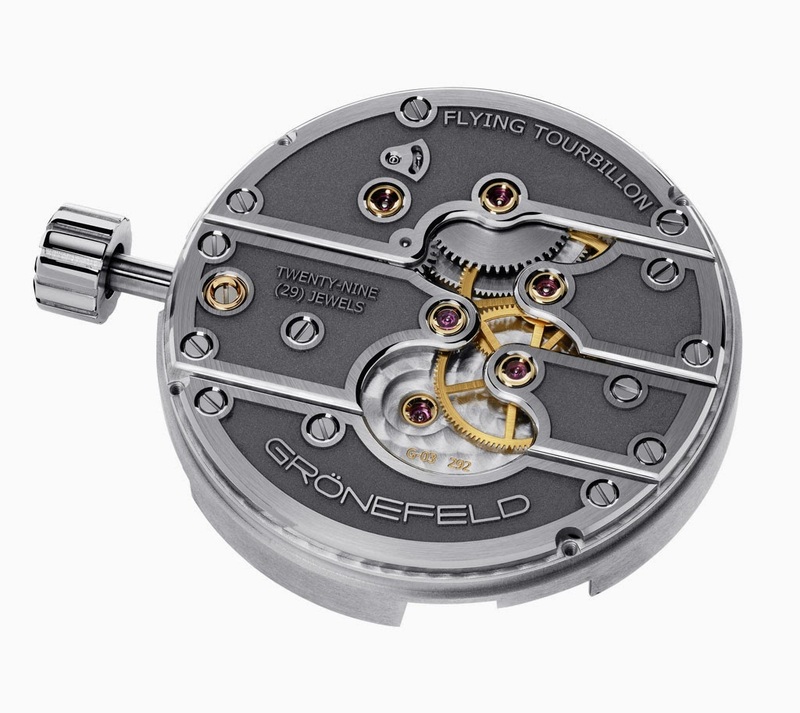 For the Parallax Tourbillon, the Grönefeld brothers developed the movement with an added pinion and wheel so that the energy-sapping friction spring is not required. 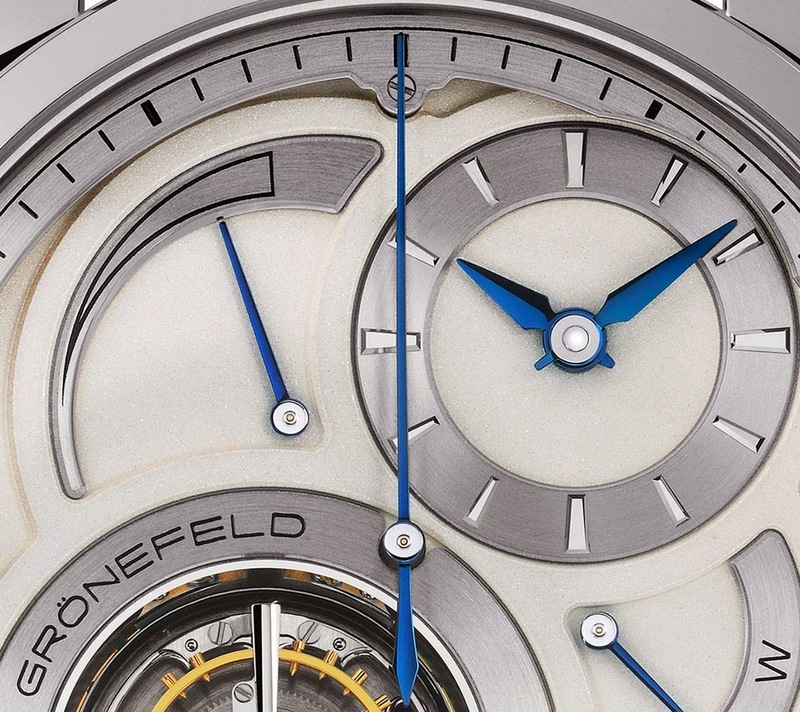 This feature improves the power transfer to the regulator and contributes to the remarkable 72-hour power reserve. The Parallax Tourbillon has another innovative feature: rather than pulling the crown to set the time, which has the risk of damaging the fragile crown stem, it is pressed. The indicator on the dial between 3 and 4 o'clock displays the function selected: "W" for Winding or "S" for time setting. When the time setting function is selected, both tourbillon cage-bridge and the central seconds hand automatically return to their respective 12 o’clock positions and stop (or hack) while the time is set. 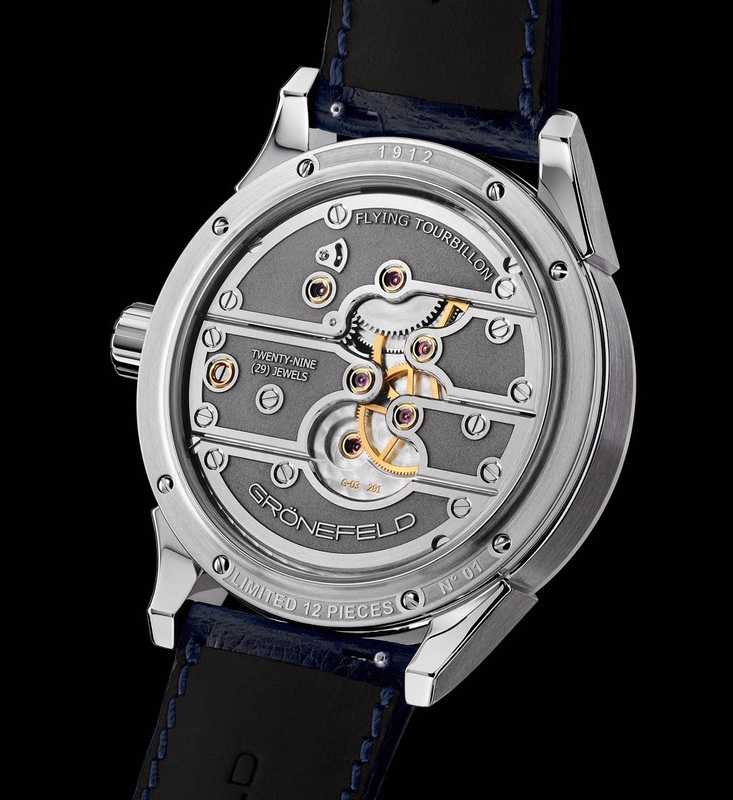 Once the time is set and the function set to winding by a simple press of the crown, both the seconds hand and tourbillon cage start running simultaneously and in parallel. The solid sterling silver dial has a frosted effect with diamond cut bevels. The hands for the hours, minutes and seconds are made of blued steel. 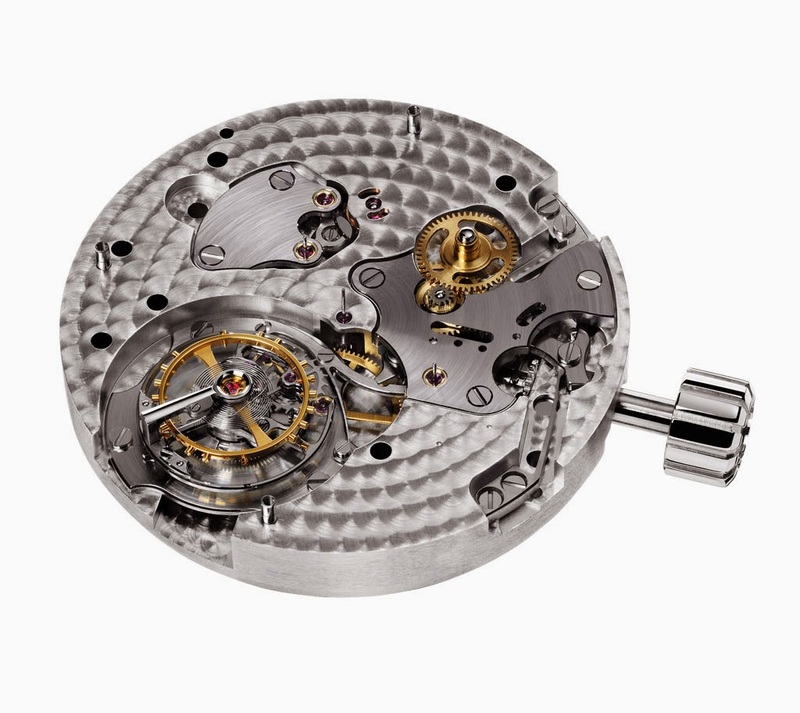 The hand wound Calibre G-03 beats at 21,600 vibrations per hour or 3Hz. Bart and Tim Grönefeld only use stainless steel bridges for their movements as it offers superior hardness and durability compared to the more generally used steel and brass. Moreover, stainless steel gleams beautifully when polished to a mirror finish. And as stainless steel does not oxidise, the gleaming finish lasts longer. Bridges are bevelled and polished by hand with circular grain finish on the top. The Parallax Tourbillon is available in a red gold or stainless steel case 43mm case. 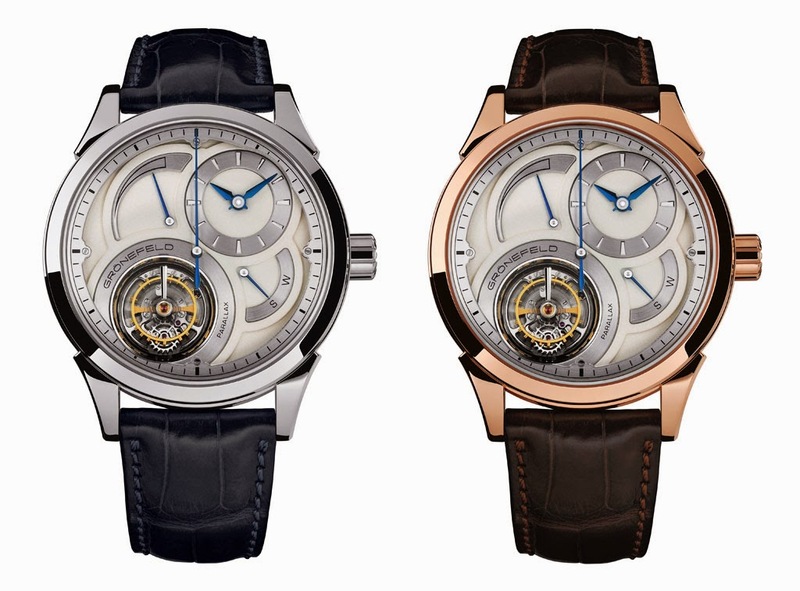 The red gold model is a limited edition of 28 pieces with a retail price of Euro 137,450 while the "1912" stainless steel model is a limited edition of 12 pieces whose unit price is Euro 134,250. 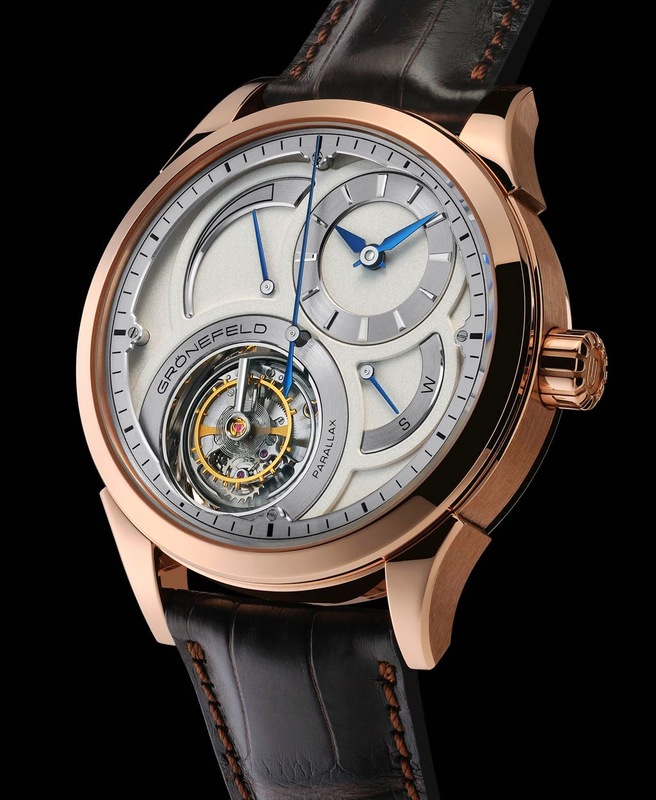 The new beauty of the Dutch Grönefeld brothers, ready to be showcased at BaselWorld 2014, is the Parallax Tourbillon featuring a "flying" tourbillon with a large central seconds hand, stop seconds, as well as a power reserve and winding/setting mechanism indications. The Parallax Tourbillon is available in a red gold or stainless steel case 43mm case. The red gold model is a limited edition of 28 pieces and the "1912" stainless steel model is a limited edition of just 12 pieces.